I have no idea why I have an aversion to updating the post. I even have a page of things written down that need to be changed or added. I’ll just chalk it up to being hella lazy … although needing to keep scrolling up and down the page and adding new anchor links is really annoying as well. You can customize sticker sets for each job type in multiplayer. When searching for parties to join, you can choose to use double the regular stamina to get twice the materials upon completing a battle. Participants need to confirm when they’re ready for battle before a quest can begin. The pages of stamps you can set per job has been expanded from 6 to 8. Quest searches can be filtered by player level. Various changes to recipies and materials that can be received from battles have been made. 1-star to 3-star quests are in rotation (so you may not see the same bosses every day). When in the Skill Panel (スキルパネル) screen, you can use items called Skill Panel Openers in place of Skill Seeds to unlock panels. They can be purchased as sets in the shop for 1000 Magic Stones each. Although the cost is the same, the amount of Openers you can obtain per set depends on the type: Bronze Openers come in quantities of 10, Silver Openers come in 5, and Gold Openers come in a set of 2. Bronze Opener – Used on panels that require up to 5,000 Skill Seeds (i.e. 10 – 4,999). Silver Opener – Used on panels that require up to 50,000 Skill Seeds (i.e. 5,000 – 49,999). Gold Opener – Used on panels that require 50,000 Skill Seeds and up. Each Opener has a usage condition. Tap the button on the top right to use Skill Panel Openers. Stop Wal from needlessly wasting the Ultimate Attack (必殺技) in battles by leaving the button in the OFF position. When it’s depressed, as seen in the screencap, he will spam the attack whenever it’s ready for use. Please note that Full Auto is only available for players who have purchased the Mobius Gift Box (メビウスギフトボックス). Full Auto is also free for all users on Mini Mobius Days (プチメビウスデー) which occur on the 8th (Japan Time) of every month. The Ultimate Attack button is in the ON position. The Pirate King is set as the Main job. The Divine Knight is set as the Sub Job. The Sub Deck is also the only place you’ll see the Swap button. After pressing the Swap button, the Pirate King and the corresponding deck is now set as the Sub. The Divine Knight and its cards is now displayed as the Main. As the heading reads, cards that are a part of the sub deck receives experience as well! (I’m unsure if you need to use the sub cards in battle to benefit from this. ^^) Sadly, only Skill Seeds from the main deck are considered on the Battle Result screen still. Someone at Square Enix actually realized how insanely tedious it was to have to pull up the screen for EVERY SINGLE CARD just to “turn on” the Auto Sell switch. This simplified version is what it should have been when they first implemented the option. 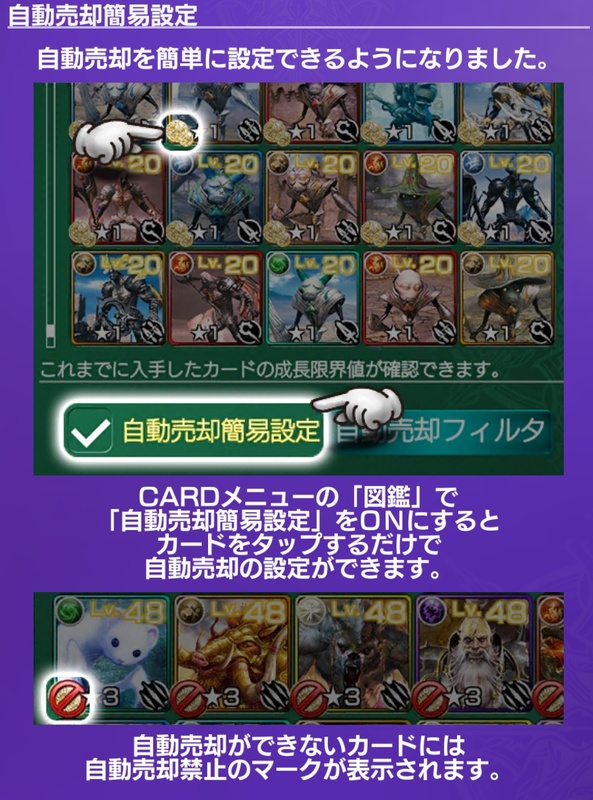 Simply tap on the button left box and then tap on the cards you want the game to automatically sell after a battle. 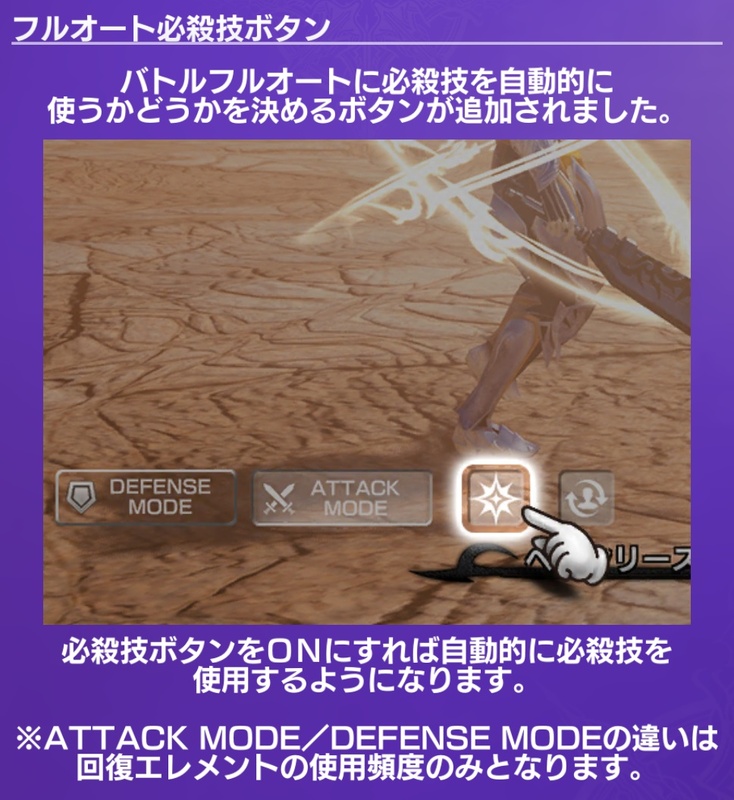 Previous PostMobius Final Fantasy – Chapter 5 Element Influence & Other UpdatesNext PostMobius Final Fantasy – 1st Anniversary Celebration!